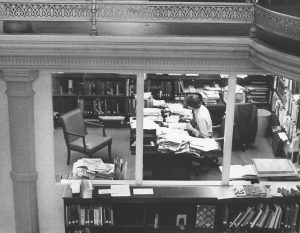 William Bond Walker, the first librarian of the Smithsonian American Art and Portrait Gallery Library, died on February 22, 2017 at the age of 86. Bill Walker was hired in 1964 to manage the joint library of the National Collection of Fine Arts and the brand new National Portrait Gallery at the Smithsonian Institution. The arts library was originally housed in the Arts & Industries Building, and Bill was instrumental in planning for all aspects of the move to the historic Patent Office Building in downtown Washington D.C. This move meant building out a new space in every detail from shelving to furniture, and establishing both a competent staff and a great library collection in a very short period of time, while navigating strong personalities in the Smithsonian. The library grew from a general art collection of 8,000 volumes in 1964 to more than 60,000 volumes when Bill left in 1980, with particular strength in American art, history and biography. Bill’s care and warmth when working with researchers and collectors was remarkable, and the donations he shepherded during his tenure are still some of the most valuable research materials held at the American Art and Portrait Gallery Library. 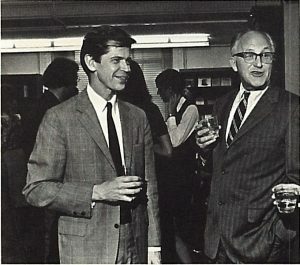 Bill Walker with collector Chapin Riley, at the reception to celebrate the Archives of American Art joining the Smithsonian Institution, 1970. 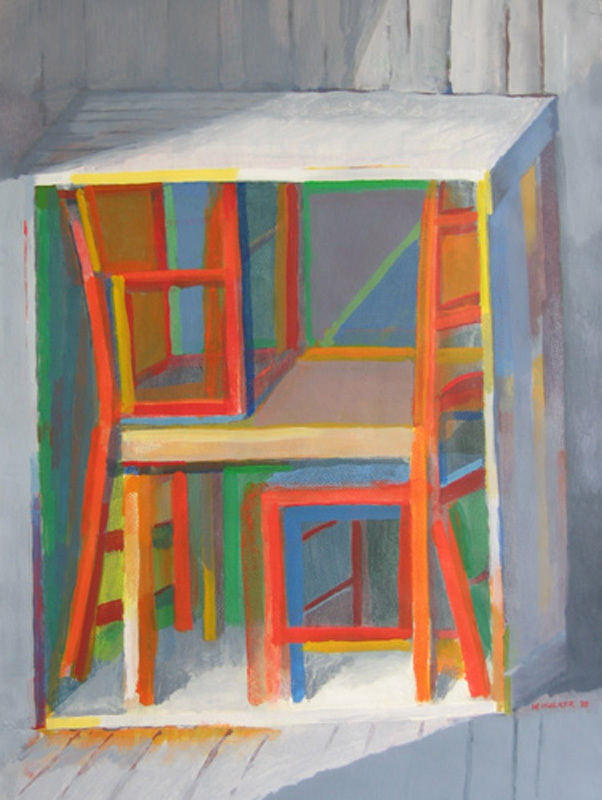 Bill was an avid painter and exhibited widely, including at the Art and Music Library of the University of Rochester and the Carrie Haddad Gallery in Hudson, New York. 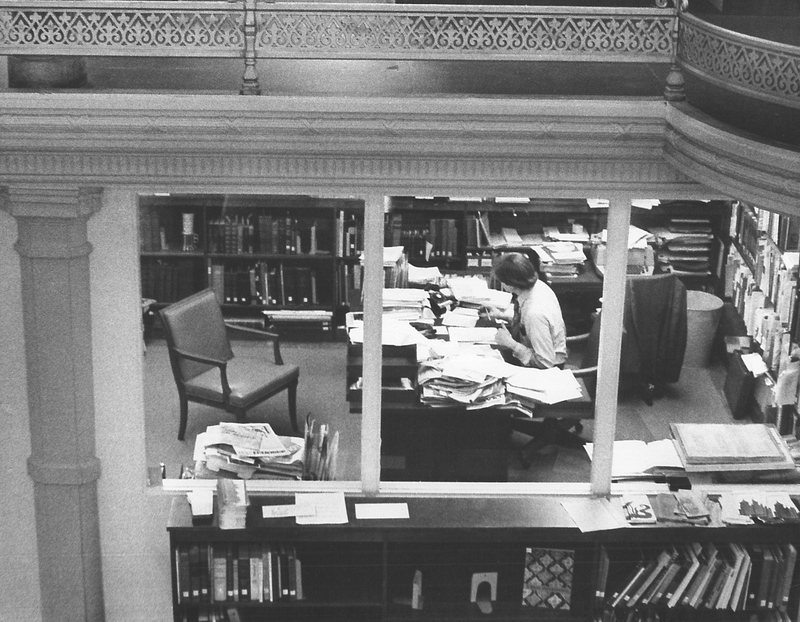 Bill began his career at the former Donnell Branch of the New York Public Library in 1955. He was a Reference Librarian at the Metropolitan Museum of Art from 1957-1959, Chief Librarian of the Brooklyn Museum’s Art Reference Library, 1959-1964, and the Arthur K. Watson Chief Librarian of Thomas J. Watson Library at the Metropolitan Museum of Art from 1980 until his retirement in 1994. 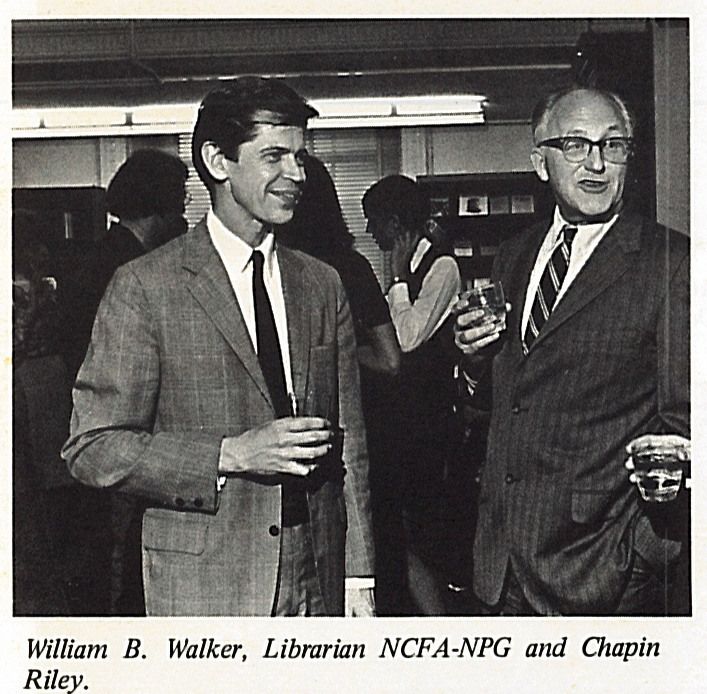 Walker was a founding member of ARLIS/NA, and a recipient of the organization’s Distinguished Service Award in 1991. Bill hired me as interlibrary loan technician in 1979. 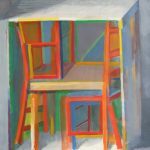 My introduction to art libraries and museums. It was the beginning of my career as an Art Librarian. I loved working at AA/PG. Bill was supportive and a great role model. Over the course of my career I turned to him for advise. Last time I saw him I was at an exhibit at the Sackler and he was visiting DC. It was good to see him and we chatted for awhile . The pictures of Bill’s farewell party in the courtyard from Kathy Martinez brought back that memory and the good time of work and play we had working there.